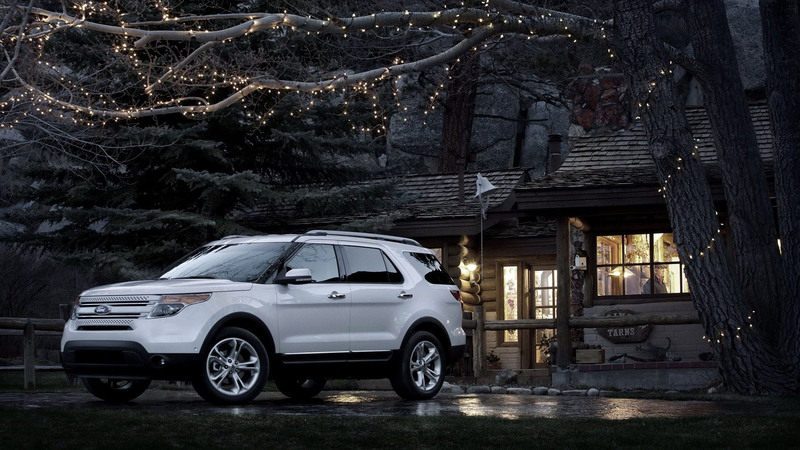 The 2011 Ford Explorer is powered by a 3.5-liter (3496 cc) 213 cu in V6 engine. The engine produces up to 290 bhp (213 kW) at 6500 rpm and torque of 255 lbs-ft (345.7 Nm) at 4000 rpm. It is a big 4900 lbs (2222.6 kg) vehicle, but it is quite fast too. 290 bhp and a 6-speed automatic with manumatic shifting transmission can make this vehicle accelerate from 0 to 100 km/h or ~0-60 mph in just 7.5 seconds. It can accelerate from 0 to 100 mph or ~0-160 km/h in about 21.3 seconds. A standing quarter mile can be driven in about 16 seconds at the speed of 89 mph (143.2 km/h). Top speed is governor limited at 108 mph (173.8 km/h). The vehicle is big and heavy, but the brakes are pretty good and you can fully stop from 70 mph (112.6 km/h) to 0 in about 174 ft (53 meters). Fuel economy is pretty decent as well (for a big vehicle like this). It consumes about 17 mpg in the city and about 25 mpg in the highway. The 2011 Ford Explorer seems to be big, well, it is quite big and its dimensions are these: The wheelbase is 112.6 inches (2860 mm) long; Length is 197.1 inches (5006 mm); Width is 78.9 inches (2004 mm); Height is 71 inches (1803 mm). The 5-door wagon features 4-wheel drive system, front-engine and 6-passenger type. It can be a perfect family vehicle, but it also can be a pretty decent vehicle for the off-road driving. The vehicle is good for many things. The original price (MSRP) for a base 2011 Ford Explorer model was set at around 39,990 USD ($), back in 2011.